After four days of unrelenting snowfall, three days of visibility-related delays and near-constant safety concerns, the sun returned to the skies above Kicking Horse Mountain Resort, revealing a deep, dazzling blanket of pristine powder on the slopes below. From high atop Redemption Ridge, with steep, narrow chutes reaching down below us like frozen fingers, we were finally able to see beyond the sweeping expanse of Feuz Bowl, to gaze for the first time upon a menacing mountain face known as Ozone. After one trepid look at the face, it became clear why this steep, imposing terrain was chosen as the venue for this international freeskiing event. Now, with clear visibility expected to continue and the mountain safety team somewhat satisfied, the sound of helicopters filled the air, TV crews emerged from their storm-proof tents, judges reviewed their scorecards and the first brave athletes hiked precariously into position. At long last, the second stop, and only North American stop, on the Freeride World Tour was set to begin. Several days beforehand, after making a last-minute decision to exchange our woefully underequipped rental car for a sturdier vehicle with winter tires, we hastily began the trek from Calgary International Airport into the mountains. The goal was to make the three-hour drive to Golden, B.C., before the low-hanging clouds dumped their contents. As the city disappeared behind us, we carefully weaved the car between alpine peaks and through narrow mountain passes, finally finding our way to the Rocky Mountain Trench just before bad weather set in. Nestled here on the Trans-Canada Highway, just inside the B.C. provincial border, lay our destination: the town of Golden. Golden, established as a rail and logging town more than 200 years ago, remains tied to these industries today. Massive logging trucks rumble through town in a nearly constant convoy as their noisy Jake brakes provide barking punctuation to the long, deep drone of rolling freight trains. After observing the main thoroughfare for a few minutes as we refuelled the car, there was no doubt that trucks and trains still play a large role in the makeup of this little mountain town today. Golden is much more than timber and trains nowadays, though; it has grown into a full-fledged tourist town with a host of year-round activities to satisfy any adventure-seeker. Kicking Horse Mountain Resort, at 2,505m and just 13 km from the centre of town, is the shining jewel in Golden’s tourism crown. The mountain boasts 1,315m of vertical, accessible by four lifts, including the Golden Eagle Express Gondola, which provides a 12-minute ride from bottom to top. 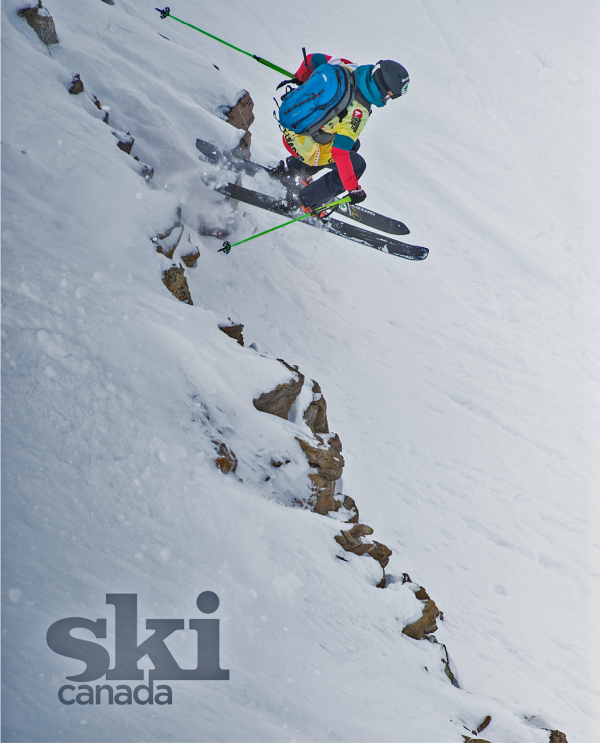 From the summit, skiers have a choice of more than 120 runs covering a wide array of raw and challenging terrain. The territory ranges from gnarly, narrow chutes to fast and fun glades, branching off from Redemption Ridge, CPR Ridge, Terminator Peak and Whitewall, leading skiers through some seriously steep double-black terrain before spilling into five alpine bowls and wide-open cruisers that hint at giving your legs a break on the way back to the gondola, but never really deliver on that promise. The conditions skiers dream of most when they think of Kicking Horse is powder. With more than seven metres of annual snowfall, we were excited to experience it first-hand during an international freeskiing competition. We arrived at our snowy destination in the early afternoon but many others, including some athletes who were coming over Rogers Pass from the west, didn’t make it before the roads were closed. As darkness fell over town, many locals and visitors alike found their way to Whitetooth Brewing Company, where the bib draw to determine the starting order was taking place. With the snowy weather firmly locked in, athletes quickly selected starting positions before the event took on a livelier atmosphere, fuelled by samples of Whitetooth Brewing’s latest beer release and the knowledge that no ski competition would happen the next day. Many drank beer that night as if beer-drinking was the main event, but sooner or later, everyone found their way into bed to dream of the bluebird skies and fresh powder that would be waiting for our foggy brains in the morning. Little did we know it would take three more snowy mornings before the weather would release its wintry grip on the mountain. Event organizers were dealing with safety concerns and delays due to a sunshine deficit, but we found ourselves smack in the middle of a snowfall surplus, so we selflessly headed out in the name of journalism and science to explore Kicking Horse in all its snowy, weather-bound glory. It didn’t take long before we found long, high ridges leading to seemingly endless lines on both sides. We dropped into big, fluffy pillow stashes; we picked our way down rocky chutes; we hucked a few cliffs that we probably wouldn’t have hucked if we had the visibility to see them coming. Then, in the name of safety, we spent the afternoon in splendidly spaced trees, using the snow-covered conifers as visibility markers. As we made our way through the pitched forest, we lost sight of each other in the heavily falling snow, each of us walking the fine line of being completely lost yet somehow completely found at the same time. Eventually, we all pointed our skis toward the base where we were reunited at the gondola line, thankful for the trail maps we tucked into our pockets before first lift that morning. We followed this routine all day—and did it all over again for the next two days straight. On day two, we ventured away from the lift-serviced resort into the backcountry and on day three we jumped on snowmobiles to seek tiny hideaways that heli and cat operators don’t bother with. On these adventures, we realized that Golden had plenty to offer besides resort skiing, but we kept coming back to the inbounds terrain at Kicking Horse. We even bootpacked our way past the top of the Stairway to Heaven chair up to Whitewall, where we stared into the blustery void, trying to make out the competition face through the precipitation, our knees knocking haplessly before we eased our skis into the whitewash. I was beginning to think waiting for weather to clear wasn’t so bad, after all, since Kicking Horse is a skiers’ mountain. While we did laps for posterity, the Freeride World Tour organizers watched the weather anxiously, hoping for a weather window to open. On day four, when the snow finally stopped falling and the sun came out, event organizers got the window they needed. The competition was being held on a face called Ozone that locals call “no-zone,” an inbounds area that has been under permanent closure for many years. The buzz spread quickly. Avalanche crews were out early, blasting their way to safety, removing extra snow and overly dangerous features. It’s a 305m beast of a face with no easy way in and no easy way out. Athletes travel far and wide to compete in the Tour and many enter the competition with hopes of becoming freeskiing’s next big name. The entire event takes place with TV cameras rolling and long lenses snapping. The 2018 competition covered five stops in Japan, Switzerland, Austria, Andorra and Canada. The travel and training schedule push the physical, mental and financial boundaries of competing athletes, many of whom are in their early 20s and trying to balance education with ski careers. Despite these challenges, nothing pushes the competitors more than the terrain does. The piste is where athletes can go from zero to hero and, unlike other forms of competition, they can do it on their own terms. At the heart of the Freeride World Tour, drawing in these young, hopeful athletes, is an all-natural, poetic skiing style that doesn’t rely on man-made features like gates, halfpipes, timing equipment and kickers. Competitors taking part in the tour come from many different mountain backgrounds and they are groomed through a series of local development programs, junior competitions and major qualifying events, all of which emphasize the “free” in freeskiing. There is no correct technique, only a set of judging criteria that places value on difficulty of line, air, style, fluidity and control. Points are awarded for “attacking” the terrain and deducted for loss of control, such as sideslipping or botched landings. Skiers are encouraged to bring their own style to events, not to follow a predetermined standard. It was late on this sunny fourth day, after half the men’s field had already skied, that Logan Pehota, Canada’s top freeskier (and son of “extreme-skiing” legend Eric Pehota, best known for his more than 40 first decents on skis), found his way into the starting gate. Pehota, hailing from Pemberton, B.C., near Whistler, was the home-country favourite in the men’s ski event and he was hungry for points after waiting days for his run. As we watched from our vantage point on Redemption Ridge, Pehota wasted no time leaving the starting gate. He built speed quickly by laying down a single, wide-arcing turn before launching himself off a cornice into a massive 360 air. Sticking the landing, he racked up valuable points in the process, before venturing into a rocky, steep, technical section of Ozone, impressing the judges and spectators with his balance of control, speed, sound technique and line choice. It was at the bottom of this speedy technical section, however, that Pehota’s run truly came alive. In a bold but calculated move, he maintained the speed he had gathered in the top section and launched himself from atop Ozone’s biggest cliff, keeping his movements smooth and stylish in the air. His landing was perfectly controlled and just laissez-faire enough to be cool without being lazy. 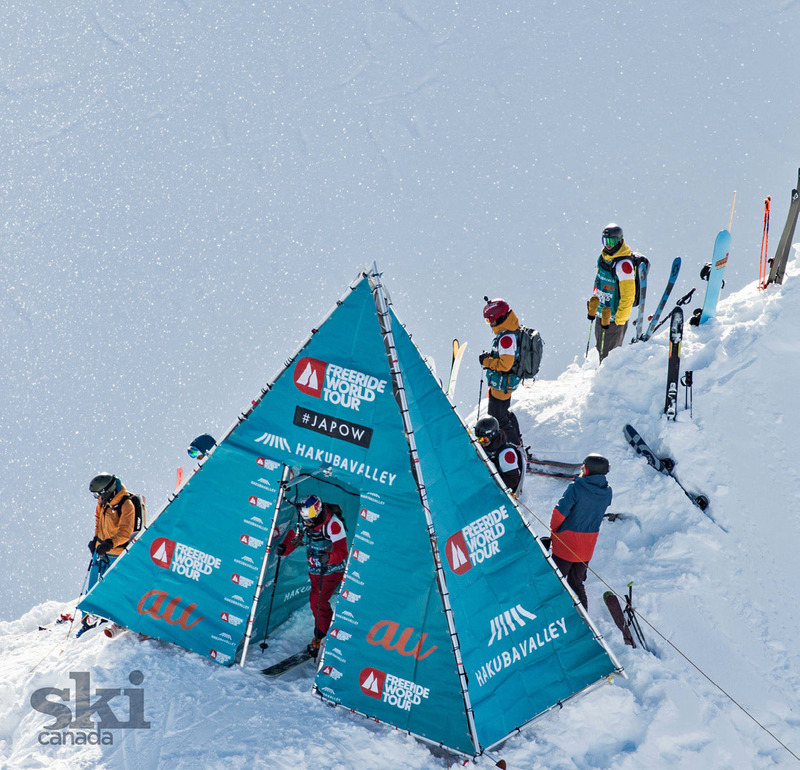 Many skiers competing in the event chose to avoid the cliff entirely, picking easier lines with more predictable outcomes. Pehota’s risk paid off, however, as he landed the biggest cliff jump of the day and arguably the biggest air of the whole 2018 Freeride World Tour. It was a sublime run that netted him a near-perfect score of 98 out of 100 points, enough for the Canadian kid to win the Kicking Horse leg of the competition, beating competitors from around the world. As the field of skiers thinned and the event drew to a close, we relinquished our perch on Redemption Ridge, descended Kicking Horse one final time by following the cat track down and letting gravity do all the work as our tired legs begged for a hot tub and a drink. There were victories to celebrate, defeats to ponder and, most important, stories to tell. 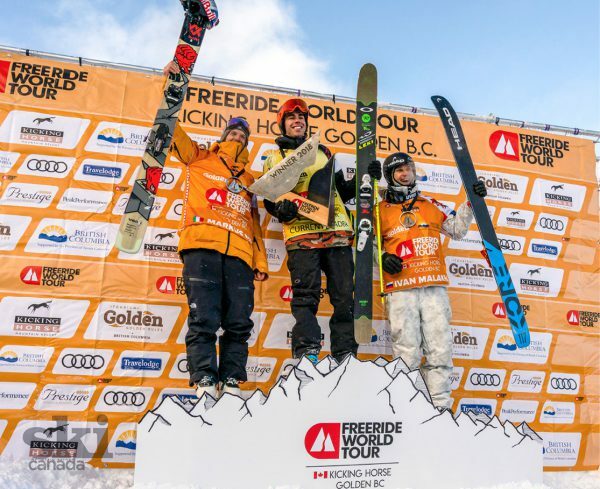 The 2019 Freeride World Tour will return to Golden on February 2-8. Some skiers have moved on from the competition; others will be coming back for more. There will be a crop of newly qualified rookies joining the tour for the first time, hoping to make their mark on the competition and ultimately on the sport of skiing itself. The unpredictability of weather will no doubt be a factor in the upcoming season, just as it was in 2018, especially in a ski town known for snowfall. The variables may change, but the wild, soulful spirit of Kicking Horse and the Freeride World Tour will remain constant, waiting for new challengers. Follow the competition at freerideworldtour.com.